I hope you know the rest of this account. Four men bring their paralyzed friend to the house to be healed, and since they couldn’t get into the house because of the crowd, they tore a hole through the roof of the house and lowered their friend into the packed home, that was likely experiencing a standing room only affair if there wasn’t even room at the door! Jesus of course heals the man. Isaiah prophesied about Capernaum. This land was occupied by two of Israel’s 12 tribes. The Assyrian army had marched through this land, conquering it. It certainly would have been a place scarred with war, a people dwelling in darkness with the shadow of death from the past laid upon its inhabitants. But as Isaiah foretold, a great light would shine upon it. Jesus was that great light. This was the hometown of Peter (Matthew 8:14) and the town in which Matthew collected taxes (Matthew 9:9). And Jesus called them to be two of his apostles. And by by making his base of operations in between missions trips Capernaum, the land of the Gentiles, he was showing his desire to save all people, to bring together the Jews and the Gentiles under one house in his kingdom. Mark says that Jesus was in his home. And Matthew says that Jesus was in his city. So whose house did these four amigos tear a hole in to have their friend healed? Jesus’ roof! I never knew that. This shows that these men had some mighty strong faith to tear a hole in the ceiling of the guy’s house they were hoping would heal their friend. It also shows that they knew Jesus’ heart – he put people before his physical belongings. This event is also when Jesus made it known that he was equal to the Father in divinity by forgiving the man’s sins. The miracle of the man walking confirmed the authority that he had to absolve sins. Matthew 9:8 records that when the crowds saw the miracle “they were afraid, and they glorified God, who had given such authority to men.” This is the same response that Peter had when he witnessed the miraculous catch of fish in his boat. He was afraid and calling Jesus Lord he asked him to get away from him, since Peter knew he was a sinful man. Jesus however consoled him and told him that he would now be catching men instead of fish. When we encounter the hand of God, as sinful men, it brings us to tremble. Here in Capernaum, the people glorified God in that fear. The Gadarenes who witnessed Jesus cast out the demons into a herd of pigs, responded by begging Jesus to leave. 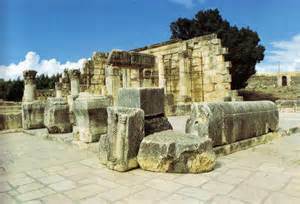 Capernaum is modern day Tel Hum. Visit www.contradictmovement.org and get a sticker, tracts, or my book! Thanks. Previous Post Why is Contradict a movement?